For those of us who had the good fortune to know and work with him, Sal Nistico was always an inspiration. Not only did his music make a deep impression on me, but also his complete and unwavering dedication to the music. There was something very pure about it with Sal. Despite his stature, he never showed signs of arrogance, preferring to break down barriers, and was always an accessible, open-minded and down-to-earth person. He lived and breathed the music, and this feeling of constant communion with the muse seemed to radiate from him. Jazz was his music, his art and his way of life, and throughout his life, he was always immensely respected by his fellow musicians. I sometimes wonder if there will be musicians like him in the future, given the way the music and the industry are developing, but when I look around, I remain optimistic. With this kind of personality, it's not surprising that Sal attached less importance to the business side of the music than to the music itself. This may have something to do with the fact that, later on in his life, he didn't receive the wider recognition he undoubtedly deserved. Perhaps the release of this CD will at least help to remedy that situation. I first met and played with Sal in 1975. 1 was 23 years old at the time, and Sal was 11 years older. He had already played with Count Basie, Woody Herman, the Mangione brothers, and as early as 1961 had recorded under his own name in New York. I remember the first gig we played together; I guess Sal was on the road and hadn't been able to get to a repair shop, so there were rubber bands all over his saxophone to replace the broken springs. The rubber bands were red, and I could see them from the piano. In the break he had complained about having trouble with the horn. This made it all the more mind-boggling, when he waved off the rhythm section in the middle of a very up-tempo version of Shaw 'Nuff and blew several choruses of solo saxophone, just roaring through that tempo with awesome time and beautiful melodic invention. I can only say that everyone in the room was blown away. I knew I had heard something very special. The tracks on this CD come from a production done at the radio station in Linz, Austria about 13 years after that first meeting. The gig was unusual in that the recording was done in front of a live audience sitting right there in the studio. This was actually very nice, because we had optimal conditions for recording and, at the same time, the intimate atmosphere of a live playing situation. This concert was organized by our friend, Robert Urmann, from Linz and was part of a small tour: Salzburg, Vienna, Linz and two nights in Munich. 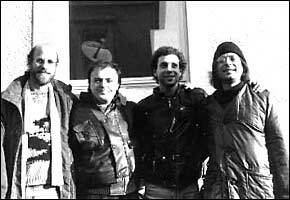 Allan and I had been playing in quartet since 1982, and early in 1988 we did some gigs in Germany and Italy with Marc, who is originally from New York and lives near Venice, and Paolo, who lives in Milano. 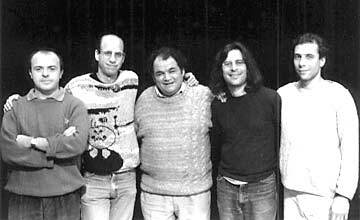 We all enjoyed playing together, so we just expanded it into a quintet later that year. Sal was enthusiastic about the idea and agreed to do the gigs. This was an opportunity to play a tune he had given to me and Allan in Spain five years earlier. The tune was Touch Light Samba, and Sal had just finished composing it, when we ran into him at a festival in Alcalá outside of Madrid. Allan and I contributed the rest of the tunes, some of which were written especially for the new group. There was a great feeling in the band during that tour. For one thing, Sal and Allan had a mutual admiration society going on, and it was exciting having them on stage together. Everyone had a good time and, of course, wanted to play some more together, when it was over. Although I tried to get some gigs, the quintet never played again after that tour, but it was one of those unforgettable experiences, and I'm very happy this music is now being made available. If some of the magic of the moment comes through on this CD, which I sincerely hope, then it was worthwhile. Every now and then an album stands out among the plethora of discs a jazz reviewer receives. Sonnet for Sal, featuring six original tunes is indeed one of these – straightahead and a real satisfyer. Cleveland-born pianist Larry Porter teamed with alto saxman Allan Praskin, tenor saxophonist Sal Nistico, bassist Marc Abrams, and drummer Paolo Pellegatti. Porter, a gifted 43-year-old pianist who earlier trained at the Cleveland Music Settlement, Eastman School of Music, and Berklee College of Music, has returned to the U.S. to live in New York after residing and working in Germany for a number of years. His discography includes many sessions as both leader and sideman with European groups. 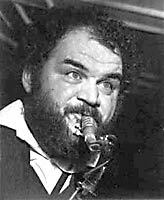 He has also toured and performed with American jazz legends Chet Baker, Archie Shepp, Art Farmer and others. This recently released album, recorded in Austria in 1988 for a live audience in the studio, was made before Sal Nistico tragically died at age 50. Freash without veering out of the mainstream, their acoustic fashionings are fulfilling, yet they do not invade all the spaces. Not necessarily designed for radio play (the shortest tune is 7:22), each long selection has its own merits and soloists are given plenty of time and space to develop their ideas. The band can deliver a collaborative sound that has all the earmarks of lengthy association. Porter and Praskin have been working together sporadically since 1982 and wrote most of the tunes on the album. Porter’s touch on acoustic piano is light, lyrical and airy, mostly noticeable on his own compositions, "Miracle" and "Water Lily". His style is warmly reflective here, though I suspect that since he has worked with Shepp he is able to stretch out into more angular modes. 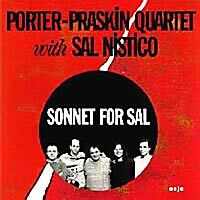 Sonnet for Sal is a jazz purist’s delight, a soulful session to be played over and over.